MEGADETH celebrate their 35th Anniversary with the release of Warheads On Foreheads, a 35-track, career retrospective. The anthology spans the bands entire studio recording career, from their first album “Killing Is My Business…” to their 2017 GRAMMY® Award winning release “Dystopia”. The collection of songs is available as a 3-CD set, a 4-LP set and a digital edition via UMe Recordings. A limited edition, four-LP set pressed on silver colored vinyl will be available exclusively through the band’s online store. 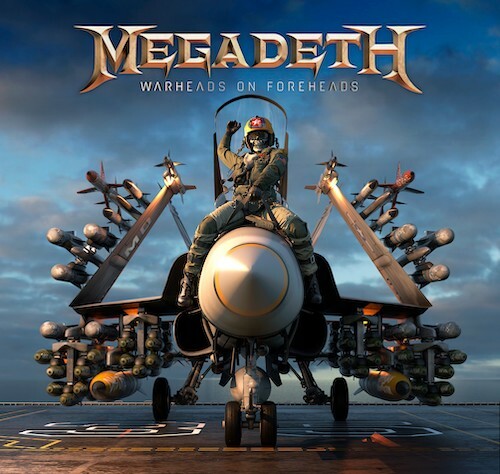 For those of you looking for a career spanning collection of songs from one of the Big 4 of trash look no further than the recently released “Warheads On Foreheads” collection from the one and only Megadeth. The three CD, four LP set includes all the songs Megadeth fans have come to love over the past thirty five years. Chronologically arranged Disc 1 includes songs such as “Mechanix”, “Killing Is My Business…And Business Is Good” and “Holy Wars…The Punishment Due”. Disc Two includes tracks like the shred-tastic “Hangar 18” and from the bands 1992 release “Countdown to Extinction” the songs “Symphony of Destruction” and “Sweating Bullets”. Disc 3 covers the bands recordings from 1997 “Cryptic Writings” up to 2016’s “Dystopia”. Here listeners can find tracks like “Trust”, “Head Crusher” and my person favorite “Public Enemy No. 1”. Production and Packaging is top notch as the 3-CD set comes packaged in a multi fold case complete with linear notes booklet. Sonically the collection features a universal mix across each of the three discs making for a great listening experience be it in the car, on your home stereo or through headphones. The piece I found lacking in this collection is there really is nothing new for longtime fans of the band. Aside from some new artwork that is it. In a career compilation such as this I would have thought including an unreleased performance video or behind the scenes footage would be a no brainer givings collectors a reason to buy the release but sadly that is not the case. If you have never bought a Megadeth album before then “Warheads on Foreheads” is the perfect pickup to get your feet wet however, unless you’re a collection completist I would skip this as it contains no new or unreleased material. 3. Killing Is My Business…And Business Is Good!